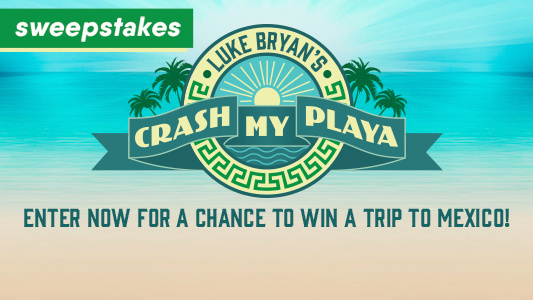 Country Music Television wants you to enter daily for a chance to win a trip to Mexico to attend Luke Bryan's Crash My Playa Party, complete with Luke Bryan merchandise and more! Grand Prize Winner shall receive a flyaway trip for two (2) for the Grand Prize Winner and one (1) guest (the “Guest”) to attend Luke Bryan’s Crash My Playa (the “Event”). Event dates are non-negotiable. Event dates subject to change in Sweepstakes Entities sole discretion. If Grand Prize Winner, together with Guest, cannot travel on dates specified by Sweepstakes Entities, Grand Prize Winner will forfeit all rights to the prize. Sweepstakes Entities are not responsible if potential Grand Prize Winner is unable or unavailable to accept or utilize a prize. The trip shall consist of the following: (i) four (4) All-Inclusive Nights from January 19-22, 2017 at the Barcelo Resort, which shall be one (1) room based on double occupancy (telephone calls, tips and other incidentals and costs are not included) (ii) admission for two (2) into the venue for each night of the show (iii) two (2) round trip coach airfare tickets (up to $1,000.00) to the Event (iv) roundtrip transportation to and from the hotel in exclusive Luke Bryan’s Crash My Playa Shuttles (v) two (2) exclusive Luke Bryan’s Crash My Playa official merchandise gifts (collectively, the “Grand Prize”). The ARV of the Grand Prize is $5,313.00. This Sweepstakes ends on 08/14/16 and you can ENTER DAILY to win.